For years, the Laotian government has been pushing to make the country a major provider of hydroelectric power. Critics say that dams are being built in disregard of potential environmental dangers, writes DW’s Rodion Ebbighausen. 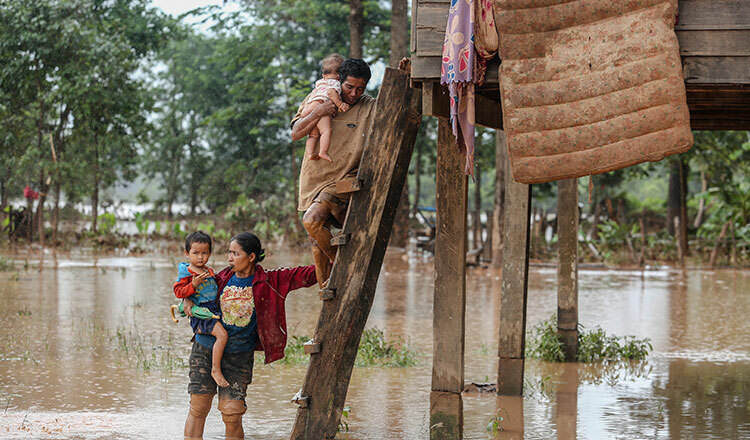 Rescue crews continue to search feverishly for survivors and those trapped by flooding after a catastrophic dam failure in the southeastern Laotian province of Attapeu. On the evening of July 23 , around 8 pm local time, part of the Xepian-Xe Nam Noy hydropower dam “fractured” after heavy rainfall, sending a massive torrent of floodwater into the villages along the Xepian River. As of Wednesday morning, Laotian authorities said 19 people had died, hundreds were missing and 3,000 people needed rescue. According to the UN, the disaster has affected around 11,000 people. Rescue efforts are being hampered by Attapeu’s remote location, which is enclosed by mountains and has few roads. Anoulak Kittikhoun from the Mekong River Commission (MRC) in the Laotian capital Vientiane told DW that a MRC station on the Mekong measured a marked increase in the water level because of heavy rain and the dam failure. “However, we have not reached the alarm level for a flood,” he said. According to the MRC, the water level of the Mekong rose from 8.4 to 11.4 metres. The MRC emphasised that there was no flood danger as the alarm level is 11.5 metres and flood level begins at 12.5 metres. This week’s dam disaster has drawn attention to the development policies of Laos’ authoritarian one-party government. Landlocked in the heart of Southeast Asia, Laos is one of the region’s poorest countries. Most of the population makes their living with agriculture. The country’s top exports include wood, coffee, and more recently, energy. Around 10 years ago, Laos’ communist government decided to make the country the “battery of Southeast Asia.” The plan called for developing the country’s vast network of rivers for hydroelectric power. The high energy demands of Laos’ neighbors also provided an incentive for development. Maureen Harris, director of the Southeast Asia program for the NGO International Rivers, told DW that dam construction in the region has escalated sharply over the last few years. Ms Harris estimates that there are currently 100 finished and ongoing projects. The problem with this rapid growth, according to Ms Harris, is that Laos is a developing country that lacks technical expertise and resources to build dams, which means they need to depend on foreign assistance. “Government policies attract investors to build these projects and most of the projects in Laos are being developed by private companies,” said Ms Harris. Private companies can then maintain the rights for the hydroelectric plants for 25 to 30 years before they are transferred to the Laotian government. Environmental activists have long criticised the construction boom along the Mekong and its tributaries in Laos, especially because of poor security and environmental standards along with the effects on local communities. “We see a pattern of underestimating the broader social and environmental impacts beyond the immediate reservoir area,” said Ms Harris. Additionally, climate change is expected to bring more rain to the region. “There is the danger that the dams are not being built with the demands of the future in mind,” she said. Like in the case of the Xepian-Xe Nam Noy dam, more rainfall than expected could cause a dam to break. However, on paper, Laos has very comprehensive regulations. But according to Ms Harris, the government lacks the capacity to oversee every project. Many dams are built in remote areas and the population there doesn’t have a chance to express their interests. “Producing hydropower can be very politically sensitive and it can be difficult for the local people to speak out,” said Ms Harris. Hydroelectric power production also has environmental consequences. The Mekong is an ecosystem that provides fish and farming for millions of people in Southeast Asia. Dams can split up coherent ecosystems, with drastic effects. “Studies show that if every dam that is planned for the Mekong is constructed, fish stocks will decline by 40 percent,” she said. That would affect the food supply of entire countries. Additionally, depending on foreign investment for hydropower development could be a risky proposition for Laos. Other countries in the region are considering mixing their energy production with wind and solar energy, which would create competition for hydroelectricity. “I think there’s definitely an issue that risks and impacts have been downplayed,” said Ms Harris.